In a radio interview with Hugh Hewitt, Clapper said the “first interaction” he had with CNN “of any sort” was on May 14, 2017, when he appeared on State of the Union. “The first interaction I had of any sort, physical or electronic, was on May 14th, 2017, when I appeared on State of the Union,” he said. “So you know, this is just sort of made up,” Clapper said, blaming House Republicans. However, Clapper’s remarks conflict with what he told House Intelligence Committee investigators in a closed interview on July 17, 2017. According to final reports by both the committee’s Democrats and Republicans, the former DNI first denied discussing the Steele dossier “or any other intelligence related to Russia hacking of the 2016 election” with journalists. But then he subsequently acknowledged discussing the dossier with Tapper. MR. ROONEY: Did you confirm or corroborate the contents of the dossier with CNN journalist Jake Tapper? CNN published their report on January 10, 2017 — months before May 14, 2017, as Clapper claimed he first had interaction with Tapper. According to memos created by former FBI Director James Comey, in early January, Clapper asked him to brief President-elect Trump on the existence of the dossier and its salacious claims, since multiple media outlets had it, and were waiting for a “news hook” in order to publish it. Comey’s briefing to Trump then became the “news hook” CNN used to publish a report on the dossier a few days later. 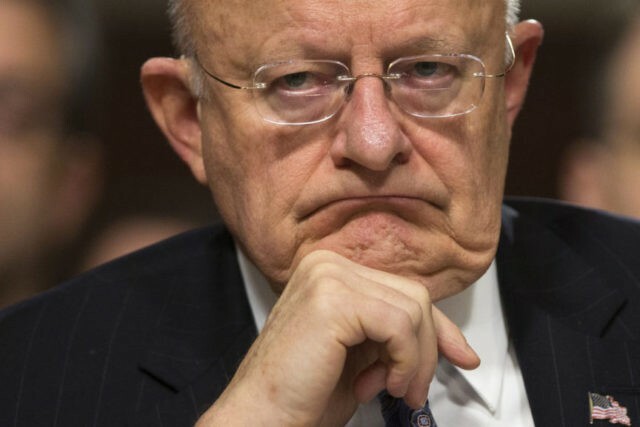 During his interview with Hewitt, Clapper also denied knowing anything until after he left office about FBI informant Stefan Halper, who reached out to Trump campaign members during the election.